This plan, which was formally known as "The American Way" was an economic system that was based off of mercantilism. This highlighted the strong nationalism in the country at the time (following a few years after the War of 1812 & and the Era of Good Feeling) in 1824. The system played a large role in the american policy in the first half of the 19th century. 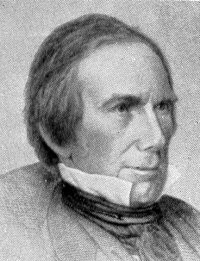 (April 12, 1777 – June 29, 1852) The creator of this system was Henry Clay, a lawyer, politician and orator. In his career he represented Kentucky in the Senate and in the House of Representatives at different points. He served three terms throughout his life as Speaker of the United States House of Representatives and from 1825 to 1829 he was Secretary of State. This part of the plan would provide easy and abundant credit through establishing the national bank. It also promoted one single currency for all states, which made trade much easier and efficient. Sovereign Credit was established, which is issued by the National government, as opposed to a private bank issuing money. A goal was made to establish better infrastructure, most importantly transportation systems, which also made trade run much smoother. Clay wanted to move away from poor roads because all it did was make the trade slow and costly. This created a 20%-25% tax on imported goods. It protected the country from losing money from foreign competition. In 1816 congress passed a tariff to raise the tax on European goods to encourage consumers to use the cheaper American-made goods.